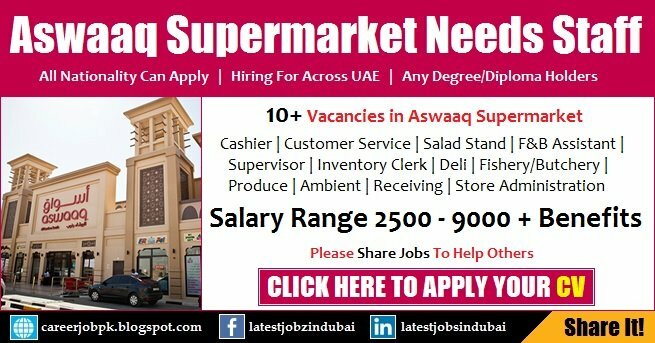 Get Aswaaq Supermarket Jobs in Dubai Latest Career Opportunity. Aswaaq is a rapid growth hypermarket which opened its grocery stores across the UAE. It is seeking highly motivated and talented individual for the following positions such as Cashier, Fisher/Butchery, Receiving, Ambient, Produce, Deli, Store Management and Store Administration. In return your work, you will get paid market competitive salary and excellent benefits as per qualification and prior work experience. Applicants must hold at least high school degree in order to be eligible. All of the listed positions would be fulfilled with 1 to 2 years of experience in retail and supermarket industry. How To Apply For Aswaaq Supermarket? If you are interested and willing to build your careers by joining with Dubai reputed supermarket then please let us know about your qualification, experience, skills and along with the necessary information through fill up the form. Customer Service, Salad Stand, F&B Assistant, Supervisor and Inventory Clerk have been filled in the last advertisement. Rest available listing can be seen above.